Recent discussion and commentary on this blog has, due largely to the highlighted topics I’ve chosen, focused on the relative feasibility of alternative energy types. This has led to some fascinating back-and-forth debate and counterpointing in the comments section of the last few posts, on the merits, feasibility, desirability and limitations of alternative zero-carbon (post-manufacture) power generation methods. Yet it has inevitably also created some confusion and misinterpretations. So to clear up these matters, this ‘thought experiment’ aims to sketch out what I see as a plausible future energy plan for Australia in the context of global action. Required goal: (derives from the climate and resource sustainability imperatives): The Australian economy will be a zero net producer of carbon emissions (and climate forcing equivalents) as soon as possible, and certainly by no later than 2050. Negative emissions (i.e. CO2 drawdown) are highly desirable for the decades after 2050. – Both coordinated and unilateral global actions results in similar zero-carbon outcomes worldwide (see postscript). – The Australian and world economy continues to thrive, but in a way that does not undermine long-term sustainability of its environment. For instance, ‘economic growth’ may well continue (e.g. expanding knowledge base, technological improvements, increasing efficiency), but not the form that is predicated on the historical model of exponentially increasing exploitation of finite resources (which assumes the Earth is a magic pudding). – Set a rising carbon price and return the income so accrued to accelerated alternative energy development and per capita dividends. Quickly eliminate ‘compensation’ and perverse subsidies for fossil-fuel energy generators. – Massive programme of investment in, and legislation to mandate, energy efficiency and sensible forms of energy conservation behaviour. Impose minimum (and tightening) standards on the energy demands of applicances, housing and commerical building codes, vehicle mileage, etc. Provide low-interest loans to facilitate uptake. – Accelerating roll-out of wind and solar thermal power generation capacity, including the demonstration of a variety of models of large-scale plants with energy storage capabilities (e.g. solar thermal with molten salts, solar towers, compressed air storage). Fixing of the currently distorted Carbon Pollution Reduction Scheme (CPRS) and Mandatory Renewable Energy Target (MRET) to allow extra room for effective voluntary additions to legislative requirements and to close loopholes and perverse incentives to double count and reward dirty pollutors. – Heavy investment in R&D and commerical-scale demonstration of wave, tidal, geothermal and microalgal biodiesel energy sources (including both direct government co-investment partnerships and commercial incentives via a carbon price). Also provide encouragment (e.g. tax breaks) for companies to establish alternative-energy component manufacturing facilities in Australia. – Publically funded investment in the transmission line infrastructure, to connect the QLD-SA-WA grids with high voltage direct current (HDVC) and lay out additional internal connections within NSW, Vic and QLD. This helps with load balancing nationally (big savings, avoids brown-outs) and runs an efficient energy delivery infructure through areas primed for renewable developments (such as the Eyre Peninsula and Great Australian Bight in SA/WA and the geothermal and solar resources around northern SA, western NSW and SW Queensland). – Active international engagement with, and support of, the Global Nuclear Energy Partnership (GNEP) , Generation IV International Forum (GIF), and their inevitable successors, thereby strongly supporting efforts by nuclear club nations such as the US, EU countries, China, Japan and India to complete commerical demonstration, certification, design standardisation and industrial-scale construction of the first of what will soon be a factory-build fleet of modular Integral Fast Reactor type (Gen IV) nuclear power stations. Point is, Australia doesn’t need to (can’t!) leadthe world with IFRs, but we can support and participate in the international development programme. – Participate in the development of a United Nations style organisation to supervise standards, construction, management and oversight of nuclear power under public ownership (Blees calls this system the Global Rescue Energy Alliance Trust, or GREAT — more details forthcoming). – Support for R&D and demonstration efforts to develop, commercialise and upscale boron-powered vehicles and MSW plasma converters. Much important engineering work can be done in Australia to hasten international progress. – Clearly and accurately (no spin!) educate the public and decision-makers about the advantages of next-generation nuclear energy, including fostering healthy debate to ‘clear the air’ about the differences between old-style and ‘newclear’ (and the problems Gen IV nuclear solves). Then, after about 2015, certify and construct one or more advanced (Gen III+) light water nuclear reactors (LWR), such as the Westinghouse AP-1000 or General Electric’s Economic Simplified Boiling Water Reactor (ESBWR). Actively foster upskilling and education in nuclear physics and engineering through Australian Universities and via international partnerships and personnel exchanges. – Open no new coal-fired power stations. Continue balanced investment in, leading to finalised development and demonstration of, coal- and gas-fired power carbon capture and geosequestration (storage; CCS) via international partnerships. Start equipping existing plants with carbon capture and storage, where it is feasible. – Assess progress made by energy efficiency and actively seek remaining untapped opportunities for ongoing innovation and technological development (accepting that these will increasingly be diminishing gains). – Evaluate major gains and unscheduled breakthroughs, costs, logistics and limitations of the last decade of large-scale renewable energy roll-out. Continue targeted investments and appropriate ‘clean energy’ incentives (including a rising carbon price) in proven or promising areas. By this stage, we should have a robust idea of how much power renewables will ultimately be able to provide to our national grid. My hunch is that this will end up constituting around 30% of 2030 electricity demand, but it may be as high as 50% or more (this is real speculation territory!). – Start transitioning our nascent nuclear industry, which by 2020 – 2025 will comprise a handful of Gen III+ LWRs, to Gen IV Integral Fast Reactors. In many nuclear club nations, heavy investment in IFRs will result in a widepread roll outof new reactors between 2020 and 2030. In Australia, from about 2030 onwards, the IFRs will be the only sort of nuclear power plant worth building, but our existing LWRs will continue to supply safe power for decades and their high level waste can be processed by the fleet of IFRs that come online over the next few decades. In this way, there is no risk or ‘penalty’ in Australia starting with LWRs and then moving mostly to IFRs as the nuclear power scale-up continues apace. At this stage, we should have a decent idea of how many IFRs we might ultimately need to complete the energy supply puzzle, and can plan our building works schedule accordingly. A building rate of 24-36 months per IFR module cluster (each supplying around 2.5 GW), with a couple being built around the country at any one times, will be eminently feasible. – Phase out the last of Australia’s coal-fired power stations that do not full capture and sequester all of their emissions, and, where possible, replace their coal furnaces with ‘drop in’ IFR reactor modules and control rooms, to convert geographic areas with stranded assets, such as the Latrobe and Hunter Valleys, to IFR superclusters. Supply IFR-based nuclear batteries to remote areas that may not be able to fully meet their needs with renewable energy. – Settle on final workable contribution of renewable energy in Australia and set conditions to encourage on-going innovation in improving capacity factors and energy storage capabilities. – Continue large scale IFR roll-out in partnership with GREAT (or its equivalent) and its numerous participating countries. By now, IFR manufacturing facilities should be developing rapidly worldwide, including in Australia. Taking account of the load already borne by our diversified renewable energy grid, add sufficient numbers of IFRs to provide the power needed to always meet (or exceed) maximum peak-load demands. The additional off-peak capacity will NOT be wasted! It will be used to run desalination works, fire the plasma burners used to generate syngas (for small, highly portable engines and perhaps aeroplanes), recycle metal wastes, and produce rock wool for construction or other nifty purposes such as artificial reefs. A major use of this ‘surplus’ energy will of course used to reduce (de-oxidise) boron (or other energy carriers) to fuel our transportation sector. – Participate in ongoing international development of nuclear fusion power (successors to ITER, for instance), right through to commerical-scale demonstration and deployment if feasible before 2050. – Participate in global geoengineering solutions, if required, to mitigate ongoing unavoidable climate change. This will almost certainly include methods to capture free-air CO2 (e.g. biomass power plants with carbon capture and storage, geochemical ocean sequestration, etc.) and potentially, active cooling such as albedo increases. Worldwide, the relative mixes of energy supply are likely to vary substantially, depending on resource availability (coastline, access to hot dry rocks, insolation and humidity, requirement to rescue stranded assets). For instance, China may have to go 70% IFR-style nuclear, with reactor modules dropped into the hundreds of stranded cooling tower + turbine infrastructure units that once serviced their massive fleet of coal-fired power stations, and where suitable geological repositories exist, it may use perhaps 10% carbon capture and storage. Its remaining mix could include wind from the southeast coast, solar PV and thermal from its deserts, and biomass. Iceland might be 90% geothermal, Saudi Arabia could be 70% solar, and many island communities might be largely serviced by an array of wave power units, and so on. Most nations would probably have decent contributions from IFR nuclear, especially to supply energy for their boron-powered vehicle fleet. Indeed, I suspect (but cannot be sure!) that majority of the energy hungry current G20 nations will be powered largely by IFRs, and with other developing nations initially taking to nuclear batteries and renewables in a big way. 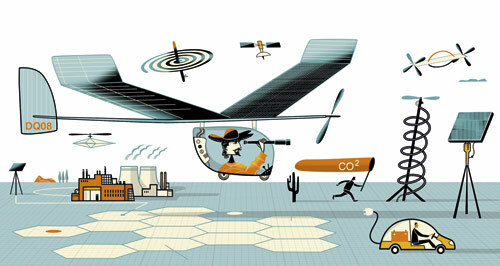 A zero carbon nation, and world, by 2050, is clearly possible. But we must have the clear vision to see it as not only vitally necessary but eminently feasible — a vision that is not clouded by preconceptions about about what solutions are ‘acceptable’ and what are not (provided the required goal (for Australia) and global context are satisfied). Why isn’t anyone in Australia working on this? In my view the infrastructure rolled out to this point, especially the trans Australia HVDC link, will be on track to supplying Australia with it’s entire energy demand especially as you advocate energy efficiency gains. Solar thermal plants strung out along the link can take advantage of the 2 hour time difference to overcome the winter morning and afternoon peaks. With this degree of geographical seperation large scale overbuilding would not be necessary as the storage requirement would be greatly reduced. Also the HVDC links could connect South Australia’s Hot Dry Rocks and the enormous wind resource along the south coast of Australia. My point is that lets say in 2019 renewables are supplying a large proportion of our energy needs and it is obvious that nuclear is not needed. Would you then abandon the need for nuclear power? For my part, if in 2019 renewables, rolled out in sufficient scale, were not meeting the demand needs of Australia I would then support limited rollout of nuclear however the only nuke that would get my nod is the Liquid-Fluoride Thorium Reactor (LFTR) as it is far more compatible with the renewable grid that would have been constructed to this point and is also more proliferation proof that even the IFR. I would not support in any context the rollout of any conventional nuclear reactors. Why not have the introduction of nuclear power to Australia subject to a referendum ~2015-2020, and with the proviso that Australia’s first set of nuclear plants be located at Roxby Downs? After all, that’s where the uranium comes from and the power lines would pass right by! If the nukes prove safe, Australia’s ‘second’ set of nukes can be built near the cities ~2070. The nice bit about the Roxby plan is that with some armtwisting and adroit industrial policy, Australia could also engage in enrichment and nuclear waste disposal as well, ‘closing’ the nuclear cycle within, say, the confines of the Woomera Prohibited Area, eliminating proliferation risk. The WPA is a Commonwealth military reservation which starts virtually on the western edge of Roxby Downs. That means Canberra can carry the can for security. Barry – you forgot one element that will be vital. Rollout plug in hybrid vehicles (PHEV) and battery electric vehicles (BEV) targeted to replace at least 40% of IC cars. All PHEVs and BEVs must be compatible with the selected Vehicle to Grid (V2G) format and must be able to participate in the smart grid to set charging times and discharging times. At the same time invest and rollout improved public transport and start redesign of cities and communities to more more walkable and bikeable. Complete transition of Transport to electricity and very minimal biofuels for tasks that cannot be done with electric transport. Complete local biomass converters for converting farm and industrial organic waste into syngas and biochar. To avoid dangerous climate change we not only need to reduce emissions from fossil fuels and related activities, we also need to reverse deforestation and degradation of ecosystems. We need to protect biological carbon stores and sequester carbon in ecosystems. This needs to be additional to reductions in fossil fuel emissions, so should not be done as an offset. If Australia was to end land clearing, end native forest logging, restore our rangelands by significantly reducing grazing from cattle and sheep and managing feral animals, use farming practices that sequester carbon in soils, and establish biodiversity plantings on land that is not suitable for agriculture, we could probably sequester more than 500 million tonnes of CO2 per year for at least several decades. We should start thinking about whether we need to phase out sheep and cattle farming in Australia. Set a rising carbon price and return the income so accrued to accelerated alternative energy development and per capita dividends. Quickly eliminate ‘compensation’ and perverse subsidies for fossil-fuel energy generators. Alternative energy developers who are funded with carbon price income are perversely subsidized: the more they are effective, the less they get. Carbon tax revenue should all be returned to the people in equal shares. I don’t see why development of boron-burning cars — or, conceivably, aluminum burners, but boron is better — can’t begin in January 2009. This sounds pretty good! Unsurprisingly, as there are similar ideas to California Energy Commission -see especially the Hot Topics piece. As I’ve noted before, Oz and CA share many issues [sun, warm temperatures, suburban development patterns, use of cars, water problems, fragile ecosystems] and some differences [you have more wind, we have a bigger fraction of hydro and geothermal]. The biggest differences are your use of coal and our focus on energy efficiency. This means: either GEN-4 designs can be made to work, or don’t expect any more nuclear plants here. Of course, unlike Oz, we have a bunch of seismic faults near which no nuclear plants are ever likely to be built. I have one wish. People get confused about R&D, which is why I wrote a post Andy Revkin promoted to an article R2-D2 and other lessons from Bell Labs. I certainly wouldn’t insist on that framework, but I’d love to see proposals tagged with some kind of scheme that makes clear how far along the R&D pipeline each technology might be. For example, in answer to #1 (fusion), in the early 1960s, I read a book about the US fusion program, which thought that with luck, we’d have commercial fusion plants in about 30 years. During my undergraduate days, until my last semester, I was planning to go into fusion physics … but was lucky enough to get involved with computing instead. Just a few years ago, I attended a climate+energy talk by a local Nobel physicist Burton Richter, who says of fusion (slide 25) “not for at least 50 years”. Now, maybe Bussard has a better idea, and Burton is all wrong, but I’d say it still looks like research (R1) to me. — something that works, but should/will have R&D (in the R2D2 scheme, usually D2-D4) to cost-reduce and improve, i.e., like solar PV. — something that needs real research (R1, R2, maybe D1), as it may or may not really work, and it will take years/decades to find out, and if we want to be involved, we need to start doing it. Some of this is in the discussion, but I urge thinking hard about ways to communicate this to broader audiences. It is always hard for people to balance short-term and long-term issues, and not that many people are experienced with R&D & deployment portfolio management techniques. It might help to try drawing a schedule chart of 2010-2060 to summarize all the words. Ender writes: My point is that lets say in 2019 renewables are supplying a large proportion of our energy needs and it is obvious that nuclear is not needed. Would you then abandon the need for nuclear power? Hey Ender, if it ever becomes obvious that nuclear isn’t needed I’ll be happy to abandon it myself. I think we’ll have a pretty good idea even before 2019, though. I’m sure Barry is no more interested than I am from an ideological perspective. It’s an issue of pragmatism. If you’re still around here in 2019, let’s discuss it again. That would be interesting! Barry, are you going to archive this? Oh, by the way, I spoke with the inventor of the plasma converter today, and there’ll be a new ethanol-producing converter due to open in July, with another very much larger one being bankrolled by some major players that’ll really break this thing open. By the end of 2009 it should be obvious to all but the most blindered that plasma converters will be the way we’ll handle waste in the future. No more kitchens with four or more trash bins. No more methane seepage and groundwater contamination from landfills. That will be sweet. This does not apply to any of the four Gen IV fast breeder designs being evaluated by GIF/GNEP, and clearly not for IFR. The rest of the document similarly ignores ALL of the benefits of IFR-type design principles (there are multiple examples throughout the text), and does not even properly represent safety features of Gen III+. To me, a dated (despite being published last year) and thoroughly unpersuasive piece of work. BEVs being battery electric vehicles. Interesting how ‘could theoretically’ is so often code for “we really can do this – it’s so obvious!” when discussing renewables’ potential (no matter how staggeringly large those numbers are), and is equally is code for “it’s not proven so don’t bother trying to pursue it!” when speaking of advanced nuclear reactors or coal CCS. Easy there Barry, Jacobson’s done some interesting a valid work here, lets not dismiss it straight up. Perhaps Jacobson is unaware of IFR’ perhaps we are unware of some amazing renewable vortex engine that is currently debated on another blog. You do identify an interesting point (above), reminicent of a similar point regarding my perception of different way IFR was reviewed on BNC compared to the detailed critical scrutity given to renwables (of which there is now properly a large peer reviewed literature base). Given the relative new public awarness of IFR it is reasonable that a couple of us take some time to aquaint ourselvs with and test some of the claims. Mark, I haven’t specifically dismissed his work on the other forms of energy (other than saying those are very big numbers he proposes which only fix 1/3 of the problem). I’ve simply pointed out that he’s not dealt with nuclear at all adequately and my critique was directed to that point specifically. My observation about ‘could theoretically’ was not specifically directed at Jacobson (though it applies), but in the renewables vs nuclear/ccs ‘debate’ in general (my position, as outlined above, is that there should not be a “vs” debate at all, simply a relative contribution debate and an assurance that all options get a fair go). Testing the claims of IFR — all good, and I’ve never objected to that, as you know. I did think it was interesting that Jacobson has attempted to to put a carbon figure on proliferation. It seems a novel idea that could help decision makers. It with this in mind I posted @10 stating that this is an “interesting and relevant paper”. I take your point that different figures will be required for IFR when they are determined (assuming the PRISM gets up soon). Regarding the big numbers in Jacobson’s and other calcs you’ve done. It would be interesting to compare these scales to other massive scales that humans are already achieving such as land clearing area vs CSP area; or PV expenditure vs new car expenditure. Eg. a saw rough calcs that costed 1000 GW of PV required to power USA at a little more than about 2 trillion- for a 20 yr investment compared to their car market ( 7.7 million new cars in 2006 in USA x $25,000 ave sale price x 20 years = $3.85 trillon). 1) this doesn’t account for learning curve cost reductions. There is less complexity and material is PV compared to a car, and we’d expect their price to drop significantly with mass production even without role out of sliver cells or nano solar. Hence I’m not too surprised at energy blueprints projection that renewable can meet the big numbers in energy demand (until we triple current demand). How much area do we crop each year globally or forest do we clear and how does this compare to the area of CSP required to meet demand with current technology? Maybe these numbers are not big compared to our current footprint? Why is no one working on this? See http://www.beyondzeroemissions.org or http://www.climateemergencynetwork.org. Look for the ZED plan, or ZCA2020 plan. People are getting organised and funding is being gathered to have a go at a plan to make Australia zero carbon by 2020, within a context similar to what Barry specifies. Volunteers welcome! Submit details via those websites. I’ve heard Jacobson talk a few times @ Stanford, and I think he’s pretty sharp. Send him email and ask him if he’s familiar with the IFR work and if that would modify his conclusions any. Here’s his websiteM, which has many interesting papers, including testimony to Congress that showed why CO2 actually damages California residents’ health more than in most states. Note that this work was probably done during 2007 and early 2008. 1) Seismic faults eliminate a lot of places, including most coastal areas near the bulk of the people. This may be emotional … but realistically, no one is every going to build a nuclear plant near the San Andreas fault. 2) Lack of reliable *water* eliminates many other sites. “California law prohibits the construction of any new nuclear power plants in California until the Energy Commission finds that the federal government has approved and there exists a demonstrated technology for the permanent disposal of spent fuel from these facilities.”, from CA Energy Commission. Hence, although CA has a long tradition of trying nuclear plants early, and contains Lawrence Livermore Labs and Lawrence Berkeley Labs, and other places that do nuclear research. we tend not to think about nuclear very much for any near/medium-term commercial possibilities. Maybe with Stephen Chu as Sec Energy this may change, but most of what Jacobson is talking about is nearer-term technology. Blees argues that IFR is the tech to both permanently dispose of spent fuel from past reactors (leaving only short-lived fission products) and to not create any more in their own operation. So it may well be sufficient to overcome the CA law — which was quite intelligently worded I must say, as it left the gate open provided key problems could be solved (many laws are a lot more unilateral). NPP can be adequately isolated from the impact of even severe Earthquakes — this is vital in places like Japan, for instance. Yes, I think that is the promise of IFR; when Hansen was out here a few months ago we talked about this at dinner. The issue is that the law was passed ~30 years ago, and there were many assurances that “disposal was coming soon”. I think many people were quite willing to reconsider nuclear on the then-current merits whenever that happened. It just hasn’t happened yet… IFR needs some serious Federal development, and CA energy folks aren’t willing to bet the state’s future on waiting for that, especially given the near-term possibilities. Earthquakes: like I said, might be emotional, but I wouldn’t waste a microsecond trying to talk people into locating a nuclear plant anywhere near a major fault, not that there are a lot of suitable sites anyway. It’s simply a waste of time. I very much doubt Australia will ever have nuclear power plants, or at least not generation III and IV reactors. This is simply because of the high cost of nuclear power compared to alternatives. The Cloncurry solar plant is going to provide electricity at a cost of about $10,300 per kilowatt. That’s per average kilowatt produced, not kilowatt of capacity. When completed the Portland Wind Project in Victoria will produce electricity at a cost of about $4,300 a kilowatt. A provisional contract cost for an AP1000 reactor at the Virgil C. Summer nuclear plant in the US is $7.7 billion or $7,300 per kilowatt. The cost of a kilowatt of new nuclear electricity in Vogtle in the US has been contracted at $10,400 or about $12,600 when transmission upgrades are included. As I doubt that companies would contract to build nuclear plants in Australia at a lower cost than in the US, and I expect the cost of wind power to continue to drop and the cost of solar power to drop dramatically, I very much doubt that any nuclear plants of a design currently in operation will ever be built in Australia. Australia, like CA, has a huge solar resource, and has more wind resource. I’m not sure about geothermal offhand. Some other places in the world are less lucky, and if it’s a choice between coal and 4GEN nuclear (if they work), I think I know which I’d pick. Of course, we both have water problems. The only reason I can think of why you might end up doing a few nuclear plants is where you can replace coal plants with nuclear and re-use the existing grid setups. That might change the economics, and with any of these, you have to be really carefully not to over-generalize prices without factoring in the geography. Wind and solar are both diffuse sources, which is fine for distributed generation, but no necessarily so handy when you want to build utility-scale facilities out in the middle of some desert not close to the users. I would like to make the case for the first power reactor in Australia to not be a LWR but a LFTR or any other gen4 that will not have a nuclear waste issue. The preferable site would be Pt August, SA to displace brown coal, thus giving the maximum benefit to GHG reductions. Also if waste heat used for desalination, would be a plus. If SA will oppose a federal waste deposit for Lucas Heights and medical isotopes, how can they support a LWR power reactor producing more waste? I think it is unlikely that labor will be diverted from GHG reduction scheme ( and green support) by raising nuclear issue and starting a construction that may never be completed. I would rather see more efforts in displacing coal with more wind and solar, better Basslink for hydro back-up, an WA/SE Australia HVDC links to WA’s wind and NG peak. A really good exercise Barry. But you seem to have overlooked the potential of revised approaches to urban housing and transport systems. You’ve mentioned the importance of mandating for “energy efficiency and sensible forms of energy conservation”, but this doesn’t really cover it for me. If we’re talking a 2050 timeline, why not at least run the numbers on optimistic potential contributions here. E.g. what about aiming to replace a significant % (pulling a number out of the air, 70%) of our current urban car trips with bicycles and public transport by 2050? What about a big program of urban farming fertilised by city-produced organic refuse, greatly decreasing carbon-intensity of agriculture? The deep exploration of changing energy sources on this blog is great. But c’mon, if it’s really an emergency, surely it’s reasonably to factor in at least _some_ fundamental behaviour change in rich nations that doesn’t decrease our real quality of life?